We believe that Greyhound Racing is not even a sport, but purely a performance forced out of greyhounds that have no choice in the matter. Racing greyhounds are trained, some in barbaric ways, and are bred over many generations to enhance the inbred ability to ‘chase’. Those puppies, for whatever reason, which don’t chase are culled. The racing industry have admitted to being unable to account for 2,478 puppies in one year alone and this only represents 20% of puppies bred for the UK market. The racing industry say 80%, of greyhounds bred for the UK market come from Ireland. Therefore it would be fair to calculate that a further 9,912 puppies are unaccounted for, purely to supply the UK racing industry with enough greyhounds that will perform and ‘chase’. More recently an exposure by The Sunday Times reported the largest breeder of greyhounds in Britain, Charles Pickering, sold healthy puppies that were too slow or would not perform to Liverpool University for dissection and research. The culling of puppies in such huge numbers is evidence alone that greyhounds are not born performers or chasers, they are simply trained to perform and chase, those who don’t are dispatched without a second thought. 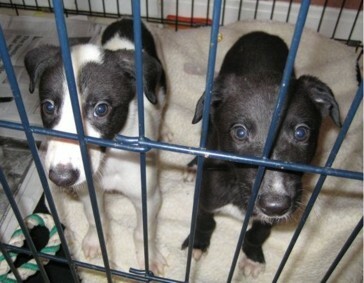 Have you ever wondered why you very rarely see a greyhound puppy for adoption at your local rescue centre? Have you ever wondered why the industry’s Retired Greyhound Trust promotes the re-homing of only ‘retired’ ex racing greyhounds? WHICH ONE WOULD YOU KILL?